One of the many captivating views of the Wave. Awhile back, I had the wonderful opportunity to hike to the Wave. I had heard much about the Wave, but was somewhat skeptical of it's splendor. My travels have shown me that all of Southern Utah's Canyon Country is amazing. Well, the Wave's fanfare is definitely deserving. It is absolutely breath taking, better than I could have imagined. With boots on the ground, the Wave is not that easy to find. There is no trail. Reaching the Wave requires overland hiking across slickrock Navajo Sandstone and loose dunes. We did found a few cairns and a couple Carsonite signs that vaguely confirmed that we were on the right route. However, many lucky permit holders never find their way to the Wave,,, and some don't find their way back. What helped me out the most was preparation. I studied the Trails Illustrated maps, in order to remember the major landmarks. Also, there are some really good hiking blogs that can offer some good visual cues. The most prominent visual cue would be "the Notch". The Notch is a vertical crack in a giant dome of Navajo Sandstone. You can see it from quite a distance away. Once you locate the Notch, walk towards it. The Wave lies at the foot of the Notch. The wild flowers were incredible. These Penstemons were everywhere! It is easy to get lost in this part of the world. Bring plenty of water and food. Oh, and pack a jacket and flashlight, because you never know what the day will bring. Another really valuable tip is PROTECT YOUR CAMERA. This is a veeeerrry sandy place. These little grains of silica and quartz will get into every nook and cranny. My camera jammed soon after reaching the Wave. Be especially vigilant if the wind is kicking up. Study the many textures of the Wave. Great for hiking, running, river rafting, camping, all-around RAD lifestyle! Order yours today for only $15 and receive FREE SHIPPING!!! Canyon Coffee has received some questions on "what is the best way to clean your Press-Bot coffee press. If you follow these simple steps you will be enjoying excellent, clean brewed, French-press coffee wherever you go. Remember, always dispose of your coffee grounds in an acceptable, LNT (Leave No Trace), fashion. This weeks featured product is the Melitta Ready-Set Joe with Travel Mug. The Ready Set Joe is an easy to use, one-cup brewer. Unfold the three stove legs. The legs will securely snap into place. Fill fuel bottle approximately 3/4 (0.75) to maximum capacity. Thread pump into fuel bottle. Pressurize fuel bottle by pumping three, or four, strokes. Open fuel valve just enough to partially fill primer cup (below stove). Once fuel in primer cup is exhausted, open fuel valve and light aerosolized fuel at top of stove burner. If stove flame is tall and yellow, shut off stove and repeat priming process. As fuel pressure decreases, give the fuel bottle a couple of strokes to increase pressure. Turn fuel valve off when done cooking. 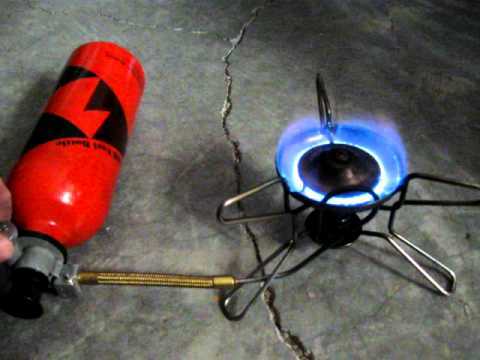 This video will show you how to light an MSR Whisperlite Stove. A few years ago, we had a fantastic Grand Canyon backpacking trip. We spent seven days exploring the Clear Creek area. The group was strong and experienced. We had hiked with them many times before. Ed and I take a moment to view Zoroaster Temple. The Brittlebush blooms were amazing. Our most experience team member, Ginger (who helped build the Deer Creek Trail), called the Brittlebush an exotic native, and that was edging it's way into the Grand Canyon from the Mohave side. Almost to Sumner Wash. Here are the troops: Mike, Jim, Gary, and Ginger. After nine long, Grand Canyon miles, we are finally looking down into the Clear Creek Canyon. You can see the deep green of the Fremont Cottonwood Trees, waaayy down in the canyon bottom. When you see Cottonwoods in the desert, you know there is water there. The hillsides are painted yellow with the best Brittle Bush bloom that I have ever seen. This is a text-book example of fossilized mud-cracks. Thanks for being our 'hand model', Ed. On our layover day, we bushwhacked up to Cheyava Falls. Cheyava is a Hopi word for 'on again-off again', describing the intermittent nature of this waterfall. Pouring out of a vast cavern system, deep within the Redwall Limestone, Cheyava's 800' drop makes it the Grand Canyon's tallest waterfall. Signs of ancient life. These Ancestral Puebloan granaries are a highlight of the hike to Cheyava. Nestled high up on the cliff side, granaries were a way the ancient ones ensured themselves seeds for the next years crop. WHOA,,,, who is this Canyon Beauty.... oh, it's my lovely wife, Ryanne Sebern. Gary Dawson is ecstatic to look out over the South Kaibab Trail, Boat Beach, and Phantom Ranch. Hi Gary Dawson. I miss you, friend. How To Make The Best Camp Coffee EVER!!! Using the Press-Bot Coffee Press. The Press-Bot is the only press that brews in a Nalgene Bottle. This place was so great that my wife, Ryanne Sebern, made me promise not to disclose the exact location. Our hidden paradise was just north of Laughlin, on the way to Las Vegas. It was Mohave camping at is best. 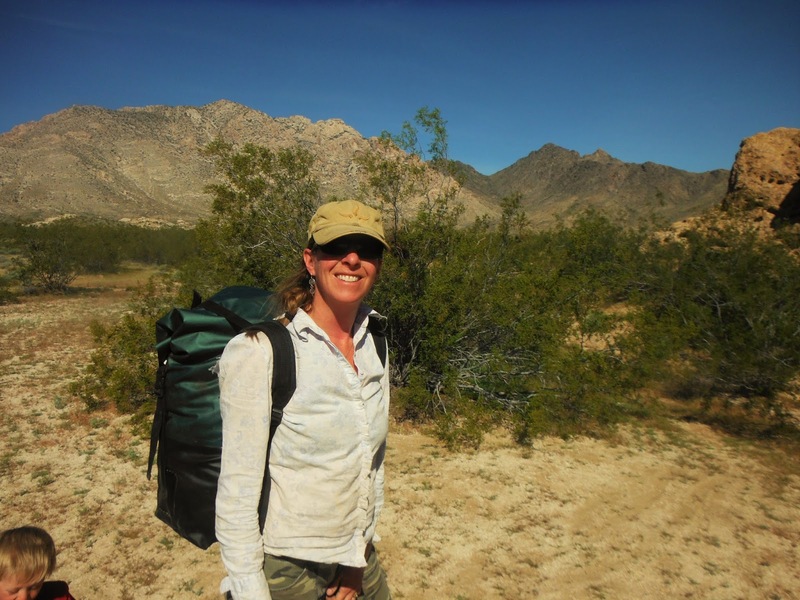 Here is Ryanne hauling our gear into the desert wilderness. We wanted to give the boys a "back packing" experience, so we hiked about a quarter mile in from the road. Our secluded camp was tucked in among some granite domes. Orin and I are heading back to camp, after a bit of exploring. Orin peaking out of a hueco cave. The granite domes had weathered, hueco caves that were fun to explore. Peaking out of hueco cave, with Orin. How to make great camp coffee! We like to start our mornings right. Fresh Brewed Coffee. This pottery was found in a shaded hueco. While out hiking, we found a bunch of pottery and many lithos sites. This piece of fossilized palm wood showed signs of being worked. Our afternoons were spent napping and playing cards in the shade. All play makes for tired boys. Of course, you have to have cold beer. Hauling a Canyon Cooler a quarter mile to camp is way worth it. Eagan and I found these neat water catchments, that were built high up in the rocks. The rock was fun and easy to climb. These globemallows were glowing with back-light. Everywhere you looked, the wild flowers were exploding with colors. Ryanne Sebern, backcountry kid-carrier, at your service. This was the last day, of a four-day backpacking trip through the Paria River. We had five strong hikers with us. What a fun trip. Bob Cheese show us how to brew up some excellent Press-Bot coffee, in a Nalgene Bottle. While on a family trip to Oregon, we took a trip to the Coast to see the famous Peter Iredale shipwreck. I remember seeing it, as a kid. So, I was really interested to find out what it looks like after forty years. On our way to the coast, we stopped off at the Jewell Meadows Elk Sanctuary. The boys had a blast seeing all the big, antlered bull elk. Eagan Ford spends some time sitting on a fence rail watching the elk go by. While at the elk sanctuary I noticed this super tiny mushroom, growing on a mossy tree. The mushroom cap was approximately 2 mm wide. What a rarity to have a sunny day on the Oregon Coast. Here is a view to the south. Looking down the beach. Sunny days, Hurray!!! My beautiful wife, Ryanne Sebern, climbs to the top of a nearby sand dune. Here is our first view of the Peter Iredale shipwreck. Remnants of a once mighty ship, the Peter Iredale. Foundered off the Oregon Coast. Here is a perspective picture to show just how big this ship was. 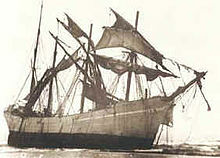 Vintage picture of the Peter Iredale, shortly after the wreck. The Space Saver Mug lovingly nests around your Nalgene Bottle. This mug is lightweight and durable. You can cook with it, too! For the Minimalist Backpacker, the Space Saver Mug is all you need for your backcountry adventures.